Ron Evans is a Partner in the Family and Personal Law Practice Group in the Firm's Richmond, Virginia office. 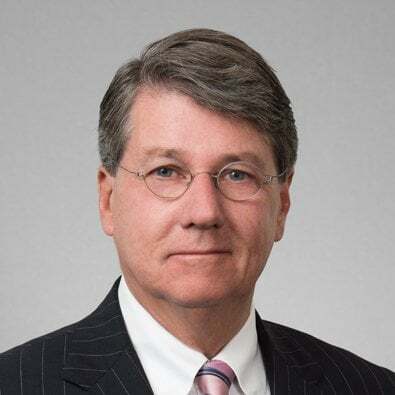 During his extensive career he has engaged in defense of industries accused of environmental crimes, defended persons accused of criminal matters, tried wrongful death cases, product liability cases, personal injury cases, and general civil litigation. His range of litigation experience is currently focused on complex family law matters including valuation of closely held corporations and professional practices for purposes of Equitable Distribution, ERISA and Qualified Domestic Relations Orders, custody, visitation and support of children and support of spouses. He has represented parties in mediation, acted as mediator, qualified as an expert witness in family law matters and been sworn in as judge pro tem to hear and determine issues in divorce cases. He also has routinely given testimony in the Virginia General Assembly in support of or opposition to bills proposing changes in Virginia law. “In all of my clients' encounters with the law, I try to empower them so that, when the litigation ceases, they can emerge stronger and with their civility and dignity at least intact, if not elevated”. Ron's addition to our team brings a wealth of valuable litigation experience in many disciplines and, given the breadth of Freeborn’s expertise, can only elevate everyone’s game. He is a member of the American Academy of Matrimonial Lawyers’ National Civility and Professionalism Committee, which attests to his interest in enhancing the profession. Ron believes that law firms, small or large, have a “personality”, being hard wired to practice the way the founders of the firm taught them, who set the tone for the entire organization. He believes that the best firms achieve the best results by having instant credibility with their clients, courts, other tribunals, and their opponents. “I was excited to discover that Freeborn’s core values are so closely aligned with those I have tried to live out in my years of practice. I believe this is a perfect match”.